This is the twenty-ninth volume in This World, a series on religion and public affairs. It focuses on theological and moral questions of deep significance for our time. The lines of division separating secular and religious outlooks, modernity and postmodernism, and romantic and classical styles of thought are some of the topics treated in this volume. Additional features are an exchange of opinions and a position paper intended to generate further discussion. This ongoing series of volumes seeks to provide a wide-ranging forum for differing views on religious and ethical considerations. 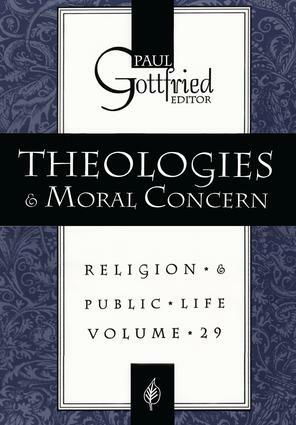 Theologies and Moral Concern include the following major contributions: "Distinctions of Power: How Church and State Divide America" by Brian Mitchell; "Beyond the Impasses: Making Moral Sense of Abortion" by Anthony Matteo; "Are Religions Ever Traditional" by Jacob Neusner; "Philosophical Issues in Darwinian Theory" by Kenneth T. Gallagher; "Monotheism and Skepticism" by Aryeh Botwinick; "Defining Romantic Theology" by Gerhard Spiegler; and "The YMCA and Suburban America" by Clifford Putney. In addition, the volume features a dialogue between Michael A. Weinstein and Paul Gottfried on what constitutes the proper role for liberal arts education in contemporary American society as well as a position paper titled "The Pitfalls of Political Correctness" by Lawrence Nannery. Theologies and Moral Concern is part of an annual survey of religion and public life which aims to provide relevant information and ideas about significant issues of the day. It is directly pertinent to understanding the connection between religion and the state. This particular volume, coming at a time of intense public scrutiny of fundamentalism, evangelicism, and new religious movements generally, should have special appeal for political scientists, American studies specialists, sociologists, and those involved in the creation of public policy.